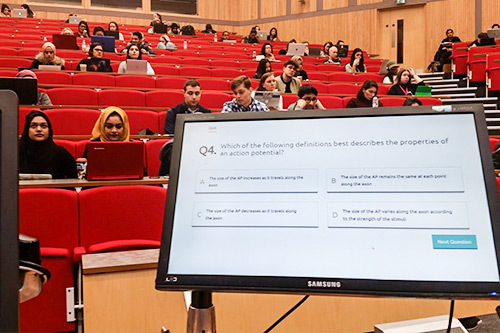 A mobile web app that allows students to take part in real-time quizzes during lectures, has been shortlisted for a Guardian University Award. The innovative tool, designed to enhance the learning experience for students at City, has been nominated in the Teaching Excellence Category. The app, named Quodl, allows students to take part in quizzes created by their lecturers. They gain instant feedback on their performance, receive virtual medals and trophies and can see how they are doing compared to others in the class. They can log in to the app at any time to review the questions and answers to identify where they need to improve or revise. Quodl was devised by City psychology academic Dr Stian Reimers. Dr Reimers used his research and knowledge of cognitive psychology to design an app that would have a real impact on the student learning experience. Making students retrieve information from memory to answer the quiz questions makes the information more accessible in the future, which in turn helps to improve their performance in assessments. The quizzes also motivate students to revise and reread previous lecture materials in order to improve their performance - another key aspect to student success. 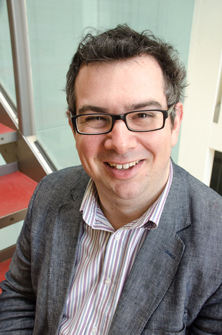 Dr Stian Reimers created the app as part of a research dissertation in academic practice, to make lectures more fun, interactive and engaging. The idea progressed from a text message based system and was developed into an app with the help of the Research and Enterprise Office. Introducing interactive quizzes to lectures means students don’t have to wait until exams to find out how they are getting on. They now receive instant feedback in a way that allows them to improve. It also encourages students to attend lectures, as they have to be present in order to participate. Being designed by an academic, it focuses on ease of use for lecturers, taking just minutes to populate with quizzes and surveys. It also provides a good measure of the students’ understanding of a topic, which helps them to plan ahead and work out which areas need revisiting. The quiz platform has had an overwhelmingly positive response from staff and students and is set to be used widely in lectures at City. Alongside the Guardian nomination, the app has received praise from staff and students alike. When the students see the scores and get their virtual medals at the end of the quiz, there’s an audible reaction: cheers and groans in equal measure. Several have said they go over earlier lectures so that they can try to get better scores and edge their way up the leader board. After initial trials with psychology lectures, the app has undergone further development and it will be rolled out across other departments in the University. Dr Reimers has also had interest from institutions across the UK and around the world when presenting it at conferences, so Quodl could be seen in lecture theatres worldwide. Quodl has been shortlisted for a 2017 Guardian University Award. The annual awards, recognise excellence in higher education and highlight “success and imaginative thinking” in the sector. City has been shortlisted in the Teaching Excellence category, along with two other institutions. It has been great to see this project go from an abstract idea, through clunky prototypes to the professionally coded app we’ve just finished. The winners of the awards will be announced at a ceremony in London on Wednesday 29th March. If you teach in higher education and would like to try out Quodl in your lectures, please contact Stian Reimers.